“It is the bounden duty”, wrote Lenin, “of class-conscious workers to conduct systematic propaganda and prepare the ground for the settlement of conflicts that may arise over the secession of nations, not in the ‘Russian way’, but only in the way they were settled in 1905 between Norway and Sweden. “This is exactly what is meant by the demand in the program for the recognition of the right of nations to self-determination”. The “Russian way” meant the way national conflicts were settled under the Tsar (and would be settled again under Stalin). Oppressed nations were told to shut up and submit. Lenin argued that capitalism simultaneously generated democratic impulses and openings, and tended to undermine them, empty them out, block them. Socialists could and should take up battles for democracy even within capitalism; we could win them; that would be of value even within capitalism. Against Spanish nationalism *and* the Catalan independence movement! The left should not pit one national flag against another. Rosa Luxemburg. The National Question. 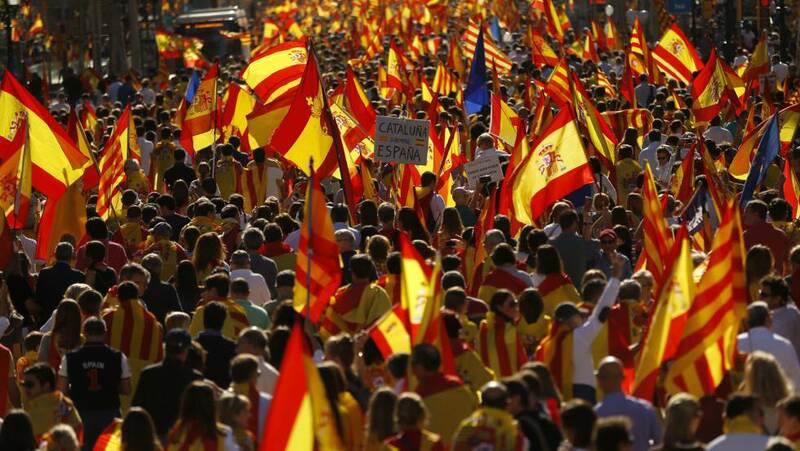 The Catalan referendum has burst on the European scene without, apparent, warning. That this is not in fact true can be seen in an informative article in the Socialist Workers Party journal, International Socialism, which concludes by putting the issue of Catalonia centre stage ( Héctor Sierra Podemos, Catalonia and the workers’ movement in the Spanish state Issue: 155) That it has been at the heart of Catalan politics for some time is well known; that there is a long history failed negotiation over recognition of the Catalan nation, and, perhaps, more pressing, calls for greater financial and political powers for the Generalitat, failing to recognise the laws that they passed, has become common knowledge in the last week. 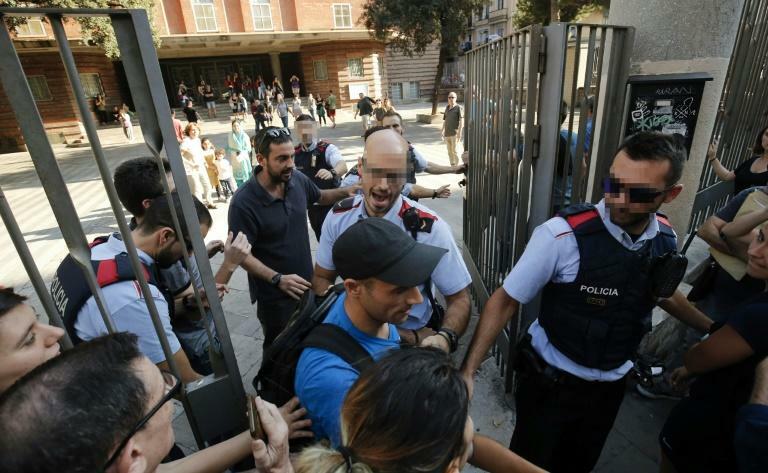 That the Rajoy government was prepared to act, brutally, on its threats against voting on independence, has stirred deep emotions, far beyond the Iberian Peninsula. But perhaps a sign of the lack of urgency the issue recently evoked in Spain itself can be seen in the exchange between a leading figure in Podemos, Iñigo Errejón and member of the country’s right-wing government, José María Lassalle on the latter’s Contra el populismo (2017) in El País (9.9.17 and 16.9.17) at the beginning of September. In this erudite discussion, the Minister of State cites Laclau, Gramsci and Stuart Hall in support of his view that the affective and political “people” has not been broken, and that the “institucionalidad democrática” remains open to the “admirado Errejón”. In Lassalle’s recognition of democratic dysfunctions, alongside a eulogy of European social peace, there is no mention of Catalonia, or of any method of dealing with those his boss considers less “admirable”. In dialogue with Chantal Mouffe Errejón, has called for a “new democratic national-popular identity”. ”The issue in Spain is whether it’s possible to build a national narrative at the service of subaltern majorities that is also respectful of pluri-nationality and the right to decide.” (2) Translated into the present, this has involved the, entirely reasonable, attempt to open dialogue between the pro-independence forces in the Assemblea Nacional de Catalunya (ANC) and the central government. What this clearly does not do is encourage people to separate, to form a distinct “us” in Catalonia, aside from the wider struggle for an “emancipatory and radically democratic project” and “popular sovereignty”. But in fact we now have a free for all for those wishing to build a “collective will” against the said administrative structure. 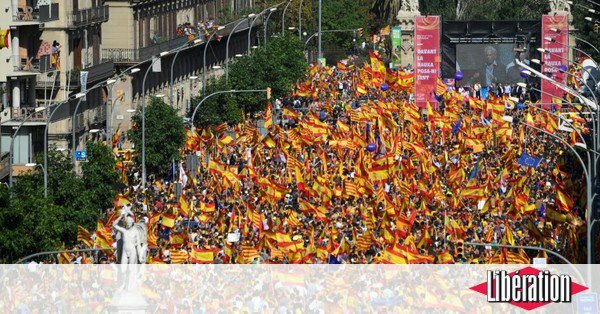 Appealing for international support for their cause some Catalan enthusiasts have not hesitated to describe the Spanish state as ‘fascist’ ‘Francoist’, full of loathing for ‘Madrid’, no doubt hinting that one of George Orwell’s most celebrated books was Homage to Catalonian Independence. Perhaps they trust to at least some of their audience’s ignorance of the Siege of Madrid, which fell some months after Barcelona. But those on the left pushing the Catalan separatists have other fish to fry. The SWP argues first and foremost for the dissolution of the Spanish state, as a potential springboard for a wider anti-capitalist struggle. The Fourth Intentional, reproducing an argument familiar to those who have heard the radical Scottish nationalist refrain of the Break up of Britain are vaguer though equally optimistic for the future of the left, and keen for, as they put it, “the democratic rupture throughout the State”. It is more than a mere historical anecdote that the Catalan independence flag is directly inspired by the flag of the Cuban revolutionaries who defeated the Spanish colonial army on the island in the late 19th century, a defeat that would decisively contribute to the ruin of the first Bourbon restoration. The struggle in Catalonia has certainly hurt the second and a republican victory would allow us to imagine a new rise of the popular movement and an update of the anti-capitalist and eco-socialist perspective in Catalonia, the Spanish state and throughout Europe. These aspirations are no doubt of comfort to those who, after what El Periodico commentators have repeatedly called a new May 68 – complete with vote – now confront potential economic chaos. Aware of these difficulties the nationalist bourgeois politicians who are running the independence show are divided on their immediate tasks, although the President of the Generalitat, Carles Puigdemont, looks determined to press ahead with a declaration of independence. Sacrifices to achieve that end are to be made in the name of a possible, not yet visible, anti-capitalism, or more broadly the eternal right to self-determination or, in their own eyes, for Catalunya. What is more precious than national independence and sovereignty? Many will without hesitation support the wish for negotiations with these demands, hard though the first two may be to put into any specific form. We can be sceptical about Iglesias’ efforts to capture the ‘floating signifier’ of the Patria for the projects of Podemos, yet see in their stand some hopes for compromise. Equally, on some things on which no agreement can be reached: one should do more than just oppose Rajoy and his clampdown, one can moblise against it. No Sleeping with the Enemy! But nobody has yet to explain convincingly why the world in general, and the left-wingers in particular, should stand behind the cause of a prosperous region of Spain, led by a coalition of right and left, to ‘take control’ in the name of the People. Rosa Luxemburg reminds us that the ‘right’ to declare this a separate entity rests on the political parties who backed the referendum, Junts pel Sí​, held together a coalition of right and left, while the Podemos inspired grouping Catalunya Sí que es Pot abstained, and the other opposition parties opposed it. (1) A useful account of Podemos, which underlines that Laclau and Mouffe are far from the only intellectual influences on the party is in Chapter 10 La Gauche du 21e Siècle, Christophe Aguiton. La Découverte. 2017. (2) Page 148 –9. Podemos in the Name of the People. Iñigo Errejón and Chantal Mouffe. Lawrence and Wishart. 2016. (3) See Agonistics. Chantal Mouffe. Verso 2013. (4) Page 198. On Populist Reason. Ernesto Laclau Verso. 2005. (5) For all our sympathy for the Podemos attempt at rational dialogue, the concepts of the People, and the National Popular function in this crisis as signs that confuse debate. See. Debating Catalonia Izquierda Unida MP Alberto Garzón debates the Catalan independence referendum with the CUP’s Pau Llonch. This is a concrete example of how ‘left wing populism’ sliding around on the Catalan national issue obscures a left strategy that gives priority to building a left. Which leads us to reject the strategy of ‘people’ versus “oligarchy”, the ‘us’ and the ‘them’ and the Mouffe-Laclau problematic: See: Populisme le grand ressentiment. Éric Fassin. Textuel. 2017. From the Statement of the International Committee of the Fourth International (Northite). Rarely do we agree with this group, but here they say some important truths which most of the English speaking left seems unable to articulate. We would add that it is astonishing that anybody who claims to be socialist or left, in the case of the Catalan ERC Republican Left of Catalonia (Esquerra Republicana de Catalunya, ERC; IPA: and the smaller pro-nationalist ‘radical’ left outside, can justify an alliance of the Catalan nationalist left with a corruption riddled (and much larger) pro-business party, the Partit Demòcrata Europeu Català, PDeCAT), also known as the Catalan Democratic Party (Catalan: Partit Demòcrata Català). It was founded in Barcelona on 10 July 2016, as the successor to the now-defunct Democratic Convergence of Catalonia. Why the name change from its former incarnation, the Convergència Democràtica de Catalunya? There is one family name that sums the reasons up, Jordi Pujol, a byword for sleaze and insider backhander, something that marks out modern Catalan nationalism. The strategy of this alliance, which won 47% of the regional vote in 2015,and 71 out of 135 seats in the devolved parliament, has been to blame ‘Madrid’ – with overtones of the profligate, lazy ‘Southerners’- for all their economic and political problems. Appararently this is ‘civic nationalism’. But then there are people who can convince themselves that the SNP is ‘left-wing’. Catalonia is Spain’s richest region, representing a fifth of the country’s GDP. The separatist parties aim to create a new mini-state, through which they can claw back taxes presently paid to central government, while establishing direct relations with the global banks, transnational corporations and the European Union. They hope to transform Catalonia into a low tax, free trade area based on stepped-up exploitation of the working class. The Catalan nationalists and their pseudo-left backers dress themselves up as progressives. However, nothing fundamental distinguishes Catalan separatism from similar separatist formations across Europe—the Scottish Nationalist Party in the UK, or those of an explicitly right-wing character such as Italy’s Northern League and Belgium’s Vlaams Belang. In all these instances, separatism has emerged in regions enjoying some economic advantage over the rest of the country, which the local bourgeoisie seeks to exploit to its own benefit. An “independent” Catalan republic, were it established, would be nothing of the sort. It would be even more dependent on the major powers, in Europe and internationally. In alliance with the EU, it would continue the policies the Catalan separatist parties pursued in their alliance with Madrid: brutal austerity, slashing funding for education, health care and other social needs and using police to smash strikes and protests. It would be a dead end for workers. Against capitalist Spain and the creation of a capitalist Catalonia, the ICFI calls for building the United Socialist States of Europe! America’s Department of Commerce has made a preliminary finding that the Canadian company Bombardier had received unfair state subsidies and sold below cost. It has now imposed a 219.63% countervailing duty on Bombardier’s new commercial jets, putting thousands of jobs at risk. Bombardier, the largest employer in Northern Ireland with a workforce of 4,100, describes the contract as “critical” to its operations. The US International Trade Commission will now consider the case ahead of a final ruling in February. The dispute centres on the sale of 125 C-Series airliners, the wings for which are made in Northern Ireland. Boeing alleges that the subsidies Bombardier receives from the UK and Canadian governments mean it is launching its new C series jets below cost in the US, and so the US trade authorities should impose tariffs. Boeing had accused its much smaller rival of “price dumping” to win a lucrative contract from the American carrier Delta. The US aerospace giant claimed each jet cost $33m (£25m) to produce, but that Bombardier had sold them for $20m (£15m) each. Bombardier also disputes claims that support it had received from governments – £75m from the UK and $1bn (£745m) from Quebec was illegal. Bombardier says Boeing’s position is hypocritical and absurd – hypocritical because Boeing prices its new planes very cheaply at launch, and because Boeing has received huge subsidies from the US government over the years; and absurd because Boeing is claiming to be damaged by Bombardier’s sales even though Boeing does not sell any competing planes of a similar size and has not done so for a decade. Canadian Prime Minister Justin Trudeau has now said the Canadian air force will not buy Boeing’s Super Hornet jets from “a company that’s busy trying to sue us and put our aerospace workers out of business.” Theresa May, in turn, has said she will raise the issue with the famously protectionist Donald Trump when she grovels to him later this week at the UN. This case provides a classic demonstration of the stupidity of those (on both left and right), who try to make out that the EU is the major obstacle that a British government faces (or would face) if it tried to give state aid to particular industries. Both supporters of Theresa May’s “industrial strategy” and of Jeremy Corbyn’s interventionist industrial policy have suggested that, when the UK leaves the EU, it will have greater freedom to apply state aid. But in a capitalist world, state aid may still come into conflict with new trade deals if one side or the other decides that such government intervention provides a legitimate reason to impose tariffs. Some sectors of the economy (of which aerospace is just one) have very significant government involvement almost by their nature. In such cases it may be very difficult to treat trade disputes as “purely commercial” matters. As things stand, it will be the US trade authorities that decide on the Boeing-Bombardier dispute. In any future US-UK trade deal, would we want US and UK courts deciding these matters, or would some joint arbitration body be a better way to adjudicate? This issue places May and the Tory anti-EU fanatics in a very difficult position, given their hostility to the ECJ and (presumably) any other supranational court with national jurisdiction. Maybe post-Brexit the little-Britainers of left and right will stop complaining about “Brussels” interfering with national governments and start complaining about “Washington”, “Geneva” … and, indeed “the rest of the world”? JD acknowledges the use of information from a piece by Andrew Lilico at City A.M. in the preparation of this post.